Stacked-NYC: What to Serve with Risotto? This question suddenly became very important today as I procrastinated on the completion of several writing projects. The easiest answers would come from a Google search, but I thought a quick check of the bookshelves was also worth a try. 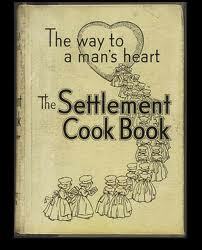 Which led, of course, to more delay, as I renewed acquaintance with an old favorite: The Settlement Cook Book. This classic cookbook by Mrs. Simon Kander (nee Lizzie Black)—with the now politically incorrect subtitle--“The Way to a Man’s Heart” has been around since 1901. The copy on my shelf is a 1987 facsimile edition, but in my mother’s kitchen, there is a battered edition that probably dates back to the 1940s or 1950s, held together with tape and bearing the stains of much use. I remember looking through it as a little girl, fascinated by the recipes for such treats as Oysters A La Poulette--basically 30 oysters, eggs and cream--or Frog Legs a la Newburg. Mrs. Kander notes that “Frog legs are nice dipped in egg and cracker crumbs and fried a golden brown in hot fat.” She also tells how to prepare lemonade for 150 people—you’ll need five dozen lemons and six pounds of sugar—and how to make rhubarb water, a recipe curiously devoid of proportions for the main ingredients: rhubarb, sugar and water. romance and domesticity that still lay far in the future. The book provides lots of guidance in sections such as “General Rules for Custard”—It curdles if cooked a minute too long—and contains not one but two recipes for cucumber jelly. As I recall, my mother’s edition included instructions on how to skin and prepare a squirrel. Mrs. Kander in later years. A recipe for Water Lily Salad--a case in point. The cookbook originated at The Settlement House in Milwaukee at the turn of the last century, where new immigrants (many of whom were German-Jews) learned skills intended to help ease their adjustment to life in the United States. 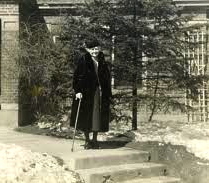 Mrs. Kander served as President and chief fundraiser of the Settlement House. She devised the idea of the cookbook to both help immigrants use at home what they had learned in cooking class and to raise funds for the organization. Advertisements in the back of the book paid for its publication. The first edition sold out within a year and by the end of 1901 a profit of $500 had been realized. You can learn more about Mrs. Kander (who was also a social reformer, despite her traditional views of a woman's role in the home) and The Settlement Cookbook in this article by Ms. Fritz. A digital version of the cookbook is available here. End note: Regarding the risotto, although I will not clean and bone the fish myself as Mrs. Kander instructs, I’ve decided on salmon. I admire Mrs. Kander for her candour. Welcome Amateur Cook. I enjoy a good play on words! As a long time user of Mrs. Kander's book, I still admire the wealth of topics, still admire the off-handed way with instructions ("pour boiled dressing over the lettuce") and still use the recipe for Rice Pudding that starts with leftover rice. A prof of mine in library school has done extensive research on recipes and how they've changed over time. In class she showed us the first known recipe published in English in Canada - for cod's tongues, an Atlantic Canada staple - and compared it with recipes from the 1950s and today, online. I wonder what the 21st century recipe for cod's tongues would look like. "The original cache of some 25,000 menus in the collection were gathered over 25 years and donated in 1900 by Frank E. Buttolph, a woman whose hobby was to visit New York restaurants and correspond with restaurateurs abroad.